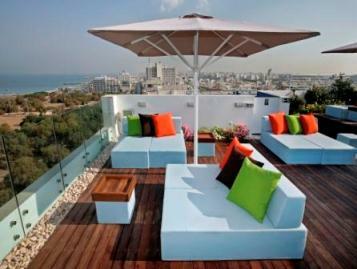 If you prefer staying at a bright, cozy hotel with great service, the Melody Hotel Tel Aviv is the place for you! This boutique hotel is in a perfect location. Its just across the street from the Tel Aviv Hilton Hotel and the beach, near Independence Park (Park HaAtzmaut), and within walking distance of the restaurants and bars along the promenade. And the Melody Hotel Tel Aviv offers complimentary bikes, so its easy to bik down to old Jaffa or up to nearby lively Tel Aviv port. As you can see from the picture, rooms at the Melody Hotel are comfortable and tastefully decorated, although they are small. If you’re sensitive to traffic noise, request a room on a higher floor or ask for a room facing east away from the main street and the beach. 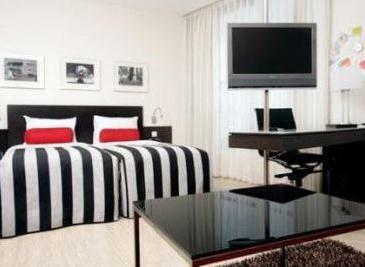 Otherwise, make sure to ask for a room with the gorgeous sea and beach view! Free wireless internet access in every room and everywhere in the hotel, and 2 computers for use in the lobby. The rooftop lounge is open is a great place to relax after a long day and early evenings are the perfect opportunity to catch one of Tel Aviv’s amazing sunsets. There is nothing like sipping a drink while watching the sun become a fiery orange ball dipping into the Mediterranean Sea!If you enjoy mingling, try meeting some guests at the rooftop or during happy hour in the lobby lounge. Guests at the Melody tend to be a varied and interesting bunch of people! I’ve recommended Melody Boutique Hotel to friends and business guests who prefer smaller, 4 star boutique hotels and want to stay near the beach. Without exception, they have all mentioned the outstanding service and the super friendly and polite staff. The Melody Hotel is part of the Atlas group which offer great-value 4 and 5 star hotels all over Tel Aviv and some other Israeli cities.